Ps: it’s the perfect time to release and clear out the old! Join me for Full Moon Healing Salon happening on the Full Moon, Sunday, April 29 @5pm PST! *everyone who signs up gets a Full moon Angel card pull! 15 is the number of Divine alchemy and it is the number I’m maxing this at. $33 USD. That is my favorite number and is also the number of the Master Creative! Everything is intentional! Want to join the Sparkly Full Moon Goddess Spiritual Salon? ps: I will put a message at the top of this post when the spots are filled! These will go quickly. The above are true manifestations and all three of them when I look back on the process (if you can call it that!) started with one major question. Q: In this moment, what would delight me? It’s different than “In this moment, what do I want? What do I need?” Both of those are nice, but they are still so cerebral-too heady to be exciting to our emotional and spiritual bodies. With delight comes…a freedom and detachment from grasp that calms the nervous system, the calculating, well-meaning mental mind and opens you up to possibility. And when it comes to manifesting love and amazingness in your life, it dials up your subconscious frequency to receive, not just what you are asking for but also subtle information from your intuition that will share what inspired actions you need to take. And when to chill the f– -out too! So, this week-try it out for yourself. And follow your internal nudges. You may have a lot of fun and when you can let the Universe delight and surprise you, you become magnetic to more. Just before the holiday craziness kicks off! It’s FREE and kicks off December 11! https://dianadorell.com/wp-content/uploads/2019/03/What-would-your-inner-Goddess-do_.png 0 0 Diana Dorell https://dianadorell.com/wp-content/uploads/2019/03/What-would-your-inner-Goddess-do_.png Diana Dorell2017-12-05 15:12:572017-12-05 15:14:31what would delight you? ever been afraid of giving the Universe the ‘wrong’ signal? I’ve got you covered! Have you ever been confused by the Law of Attraction and felt worried that you would give the Universe the “wrong” signal? Q: Have you ever struggled with giving the Universe mixed signals about what you wanted? What is one thing that helped you move through that? Share with us the comments below! I’d love to send a free gift to help you trust and love yourself! Click here to get free weekly updates! 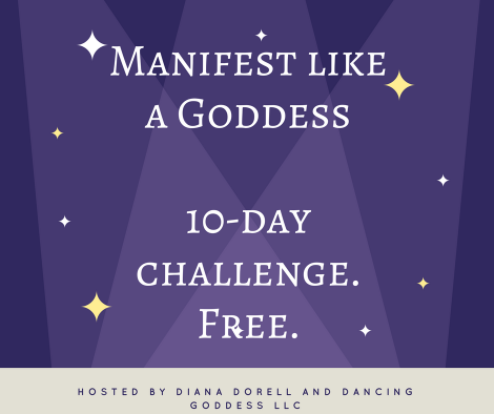 https://dianadorell.com/wp-content/uploads/2019/03/What-would-your-inner-Goddess-do_.png 0 0 Diana Dorell https://dianadorell.com/wp-content/uploads/2019/03/What-would-your-inner-Goddess-do_.png Diana Dorell2017-01-10 10:53:432017-01-10 10:53:43ever been afraid of giving the Universe the 'wrong' signal? I've got you covered! The biggest roadblock to love is….<drumroll>…. linear thinking. Erroneously believing that just because something didn’t work for you in the past, it means that it will never work for you. Or conversely, because something you tried did work, believing that it’s always going to work if you do it that same exact way. When you declare to the Uni-verse that you just “don’t do XYZ”, you’ve already cut off a possibility. It’s a weird form of trying to control your environment and the outcome. Usually because the fear of being rejected, used, abused, left, etc is driving your decision-making. I felt the same way about dating online. I felt like it was so incredibly superficial. And maybe there’s some truth to that putting your best pictures up and neat paragraph description of who you are on display, but I still put myself out there as a symbol of my intent. I was going to go all in and if “he” didn’t show up, I chose to stop assuming that it was the medium (being online or being on a blind date) but instead chose to see it as an experiment where Divine timing, my level of commitment to what I said I wanted…and synchronicity were also important factors. In short, it’s about going all in, following the signs as you receive them…and lovingly nudging your fear and doubt voices to calm down. Your worthiness and value is not dependent on the outcome of the experiment. The experiment is simply that….an experience where you can see what shows up and most importantly the energy in which you are choosing to show up for yourself. And looking purely at the results, two of my most profound, Soul-shaping relationships came from meeting them online. My aunt, who had just gotten divorced and had never done the online thing let me help her with her profile, despite hemming and hawing about not being technology-saavy or into the whole thing. She’s been happily hooked up with the same loving partner for almost 4 years now that she met. But if she hadn’t considered that what she was fighting against could actually be an avenue to support her in meeting her match, she may have been spending her nights at home with the TV hoping he would just appear. This week’s Soul question (deep!) Where could you be setting up a roadblock for yourself? Helpful hint: If you aren’t sure, look at places where you have felt resistant or emotional or extra opinionated around. Would you be willing to try that “thing” again with an experimental energy vs a reactionary one? What could be possible for you? Ps: Are you signed up for my FREE training, 3 Online Dating Secrets to Stop Wasting Your Time…and Get The Guy?